March 19th, 2008 | Author: Dave Q. Car washes across San Antonio are about to get busy. Yesterday afternoon, it basically started raining dirt. The sky turned from a blue to a kind of yellowish tinted color, and then it drizzled. And that basically put mud everywhere. I’ve never seen anything like it before. 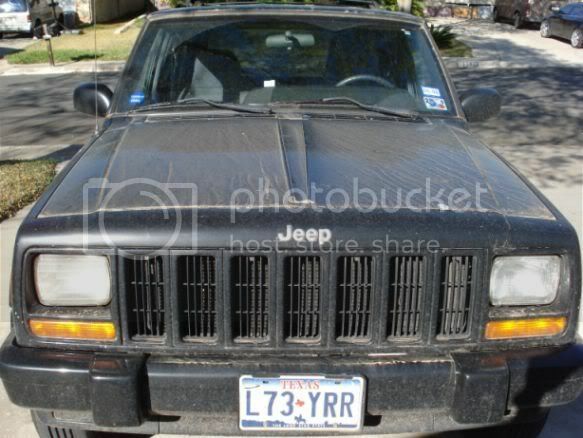 As you can see, it left a nice layer of dirt on the surface of my Jeep after things dried up. I guess I should be happy, considering the Jeep was a little dirty to begin with. Now no one can say crap to me, since pretty much everyone is going to have “wash me” written by finger on the back of their vehicles. According to the local weather experts, the cause of the rain coming down like this was a combination of ash and dirt in the air from a big fire in central Mexico. Way to go, Mexico. You never stop impressing me. BTW, I know the begining of the video sounds bad with all the wind blowing. But I blame Mexico for that weather phenomenon, too.